Can You Really Make Money Writing For DuffelBlog.com? This is a famous satire site that publishes content about the US military. But can you really make money writing for DuffelBlog.com? Do you have what it takes to be a satire writer? Do you have previous military experience and the writing skills to pay the bills? These are all questions that you should ask yourself before pitching to this website. DuffelBlog.com says, on their ‘About' page, that ‘they have been serving the men and women of the U.S. military with insightful commentary and hard-hitting journalism since 1797.’ They also make reference to the fact that the blog earned its reputation for being ‘edgy’ by reporting about President John Adams’ $200 a week cocaine habit back in March of 1799. Yes, Duffel Blog is a satire site. In fact, further down on the About page, they make this disclaimer. So yeah… I got a good laugh so far out of the site, and I had not really even gotten into the content. But I will say that I LOVE satire. I am a faithful reader of The Onion, and love pretty much everything they put out. I actually believe that satire is an incredibly useful and beneficial journalistic tool. Not only is it entertaining and light-hearted, but it often also conveys small tidbits of truth. The truth may not be in the details, but the ridiculous stories often published in satire almost always reflect a deeper truth about how that particular topic is perceived by the masses. And because of this, it can help to bring awareness and spur thought. And to me, as a journalist myself, that is awesome. On a personal note, I am not what you would call a ‘typical' journalist. I usually write about apps, websites, side-hustles, and ways to make extra money. My goal is usually to help provide our readers with quality information. But there is also a part of me that hopes that anything I write might make the world a better place; and I can't help but to think that satire is an example of this kind of writing. But now I will step off of the soap box and talk a bit more about my reason for looking into this site. I sometimes do some freelance writing as a side-hustle, in an attempt to earn a bit of extra cash—and Duffel Blog caught my attention because word-on-the-street is that they pay freelance writers to contribute to their blog. I can actually confirm that this is absolutely true—but we will talk more about that in a moment! First, let’s take just a second to talk about freelance writing in-general. Why Freelance Writing As A Side Hustle? There are a lot of different apps and websites out there that claim to help you earn extra money, and to be honest, many of them can. There are survey apps, shopping apps, cash-back apps, websites that ask you to answer questions in return for compensation, websites that reward you with gift cards for watching advertisements or downloading apps, etc. There are a lot of different ways to earn extra money online. But freelance writing offers you a side hustle opportunity on an entire different level. There is a huge need for content right now, because more people are using the internet than ever before. And yet, since writing is kind of a skilled side-hustle opportunity, not everyone can just jump right into it. It also pays a lot more than survey apps and other similar side-hustles. So yeah, if you don’t have the skills to write a professional article, this might not the be the side hustle for you. But if you do have the skills, and you are willing to put some effort into it, you can actually make a lot more freelance writing than you can with any survey apps or anything like that. But the downside is that freelance writing isn’t as easy. You often have to pitch to websites to get jobs, and that can take work, practice, and patience. And to be honest, one of the hardest parts is finding websites to pitch to. That is why I am doing what I am doing. I am doing this research for you as I look for my own freelance side-hustle opportunities… and am forwarding the very best options that I find on to our readers. So if you are looking for websites that actually pay writers, you will absolutely want to take a look at Duffel Blog. With that being said, let’s move on and talk about it a bit more. It doesn’t take a rocket scientist to see exactly what kind of gig this is. This is a satire blog dedicated to satire stories featuring the American Military. It has categories for the Army, Navy, Air Force, Marines, and Coast Guard, as well as a shop where you can buy merchandise. The site does have some advertisements strewn throughout, which is understandable. That is probably how they keep their website afloat. If you browse through the topics, you will very quickly get a feel for the style of the site. I scrolled through some of the blog posts in a few of the different categories, and read a few of them as well, just to familiarize myself with the style and feel of the content. One thing that I do have to point out here, though, is that this site is only looking for current or former military personnel to contribute to it. So if you have never been in the military, this is probably not going to be a gig for you. Of course, this job would also demand that you are a skilled writer, and that you have the ability to write quality satire. With that being said, the content on the site was quite good. Some of it almost sounded a bit ‘unimaginative’ when compared to some satire I've read, but it was still funny, in a ridiculous kind of way. Most of it was very fun, and just believable enough to be truly hilarious. And some of the articles, I am surprised to say, were QUITE edgy! I almost felt a bit guilty just for reading some of it—though I also have to say that it made me smile. The site certainly sets high standards for their writers. The content is witty, well written, and professionally formatted. Everything appears very professional, and though the stories are satirical, it is obvious that the writers have enough service experience to know what they are talking about. So let’s talk about what it takes to become a writer for Duffel Blog. Finding the Contribute page was pretty easy. You just go to the ‘More’ tab, scroll down to ‘About,’ and then scroll down some more to get to ‘Become A Contributor.’ Here is a screen shot of the small blurb they keep posted here. There isn’t a ton of information posted here. It sounds more like they are just generally describing what they are looking for. They also as for 15 headline pitches and a writing sample if you apply, which is obviously understandable. They do not specify how much they pay for articles, though I have come to understand that they do have a book in print. You can also follow them on social media. I must say that I loved this site. It is quite clever, the satire is on-point, and I will also say that I found it thought-provoking. I have never been in the military, in any capacity—so I am not qualified to write for it. That would keep me from being able to pitch to it. 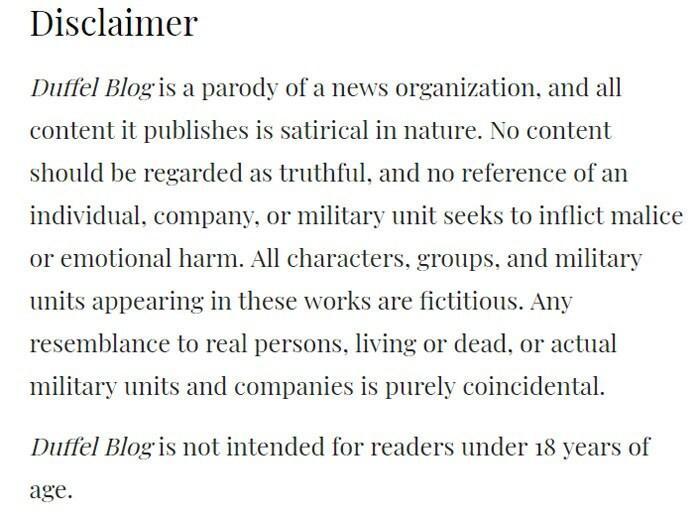 But if you have been, and also fancy yourself a skilled writer with a flair for satire, then I hope that you will consider pitching to DuffelBlog.com… because it really is a fun site to read, and I have no doubt that they would be great to work with. Obviously, there is no guarantee that what you write will get published. There is always the possibility that your pitch could get rejected completely. But, with that being said, there is also always the chance that you could be wildly successful—and that is what hopeful, positive content writers should always be thinking when they are considering sending a pitch to a new website or publication! You will likely not make a fortune writing for this site (or any other similar site, for that matter). But getting published on a blog like this can do a lot to help you further your career. It can give you an awesome reference and some valuable writing-cred, especially if you plan on pitching to other satire sites in the future. And of course… it can provide you with some decent side-hustle cash! So yeah. Two thumbs up to Duffel Blog. I liked it! Should you pitch to them and try to make some extra money as a freelance writer?